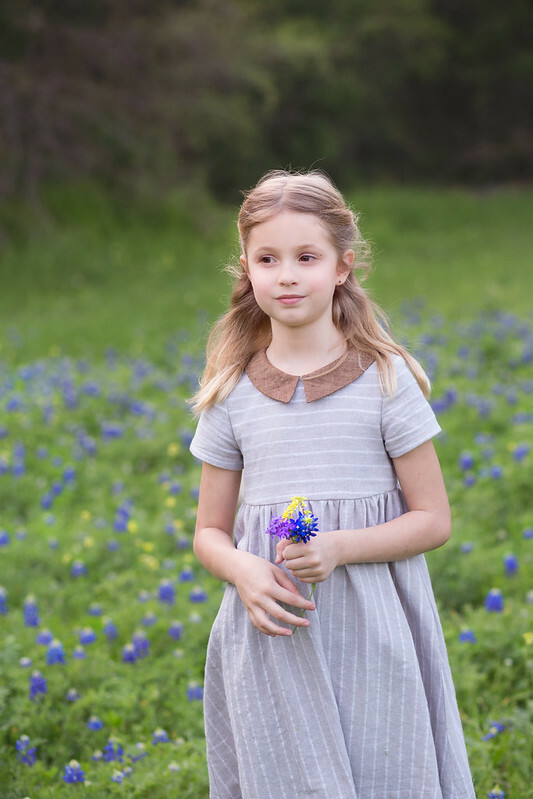 In my ongoing mission to restock Indigo's closet, I scoured the Internet for patterns that seemed right for her. I keep getting derailed from the aforementioned mission by finding the cutest patterns for Tia and Iris. Indigo's age is harder for me. But this said, after doing some research, I'm excited by the possibilities, too! I landed on this pattern, Burda Peter Pan Collar Dress #138 to try first. Did you know that Burda has PDF patterns? And they're only $6 each. The pattern prints in a way that you don't have to cut away any paper edges to tile them. That's pretty slick! You can tape the pattern together in no time. But you do need to add seam allowances. Not a huge deal, but a little inconvenient to have to tile a pattern and add seam allowances. 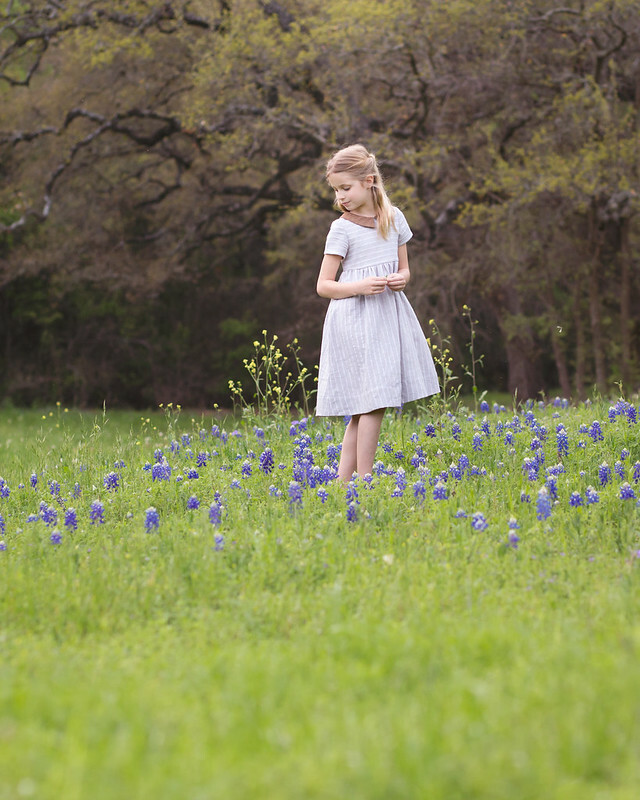 I sewed the dress in a linen from Joann's. After trying out a lot of different kinds of linen, I have come to the conclusion that Joann's is the best. It's soft, unlike some linens which get hard or even scratchy when line-dried. Also, they don't wrinkle as much as some of the other linens I've tried. I have a tendency to leave my clean laundry in a basket for a long time before folding. So much ironing. When will I ever learn? And check out the drape of this linen. It lays so beautifully. Alicia Paulson mentioned that adding a wide 3-inch hem helps everything hang right, so I decided to give it a try. That may have been part of it. But this linen really is spectacular. It almost feels like a double gauze. 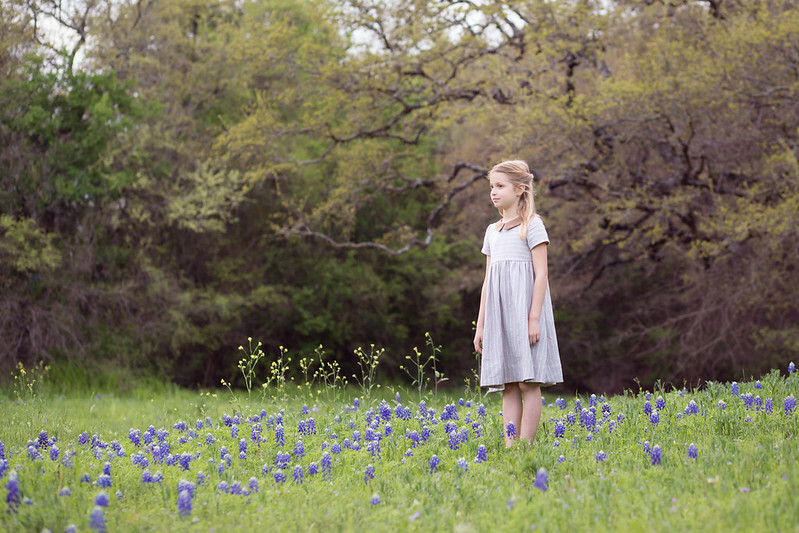 Indigo and I went to take photos by a fence in our neighborhood when we discovered this field of wildflowers in bloom. Incidentally, the very same thing happened last year. 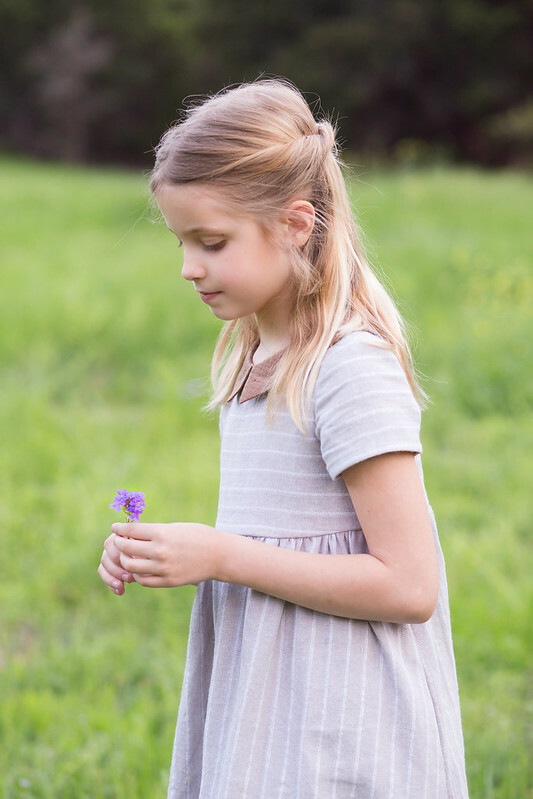 Indigo is a a nature lover and spends hours outside every day, building fairy houses, working in the garden or just playing. 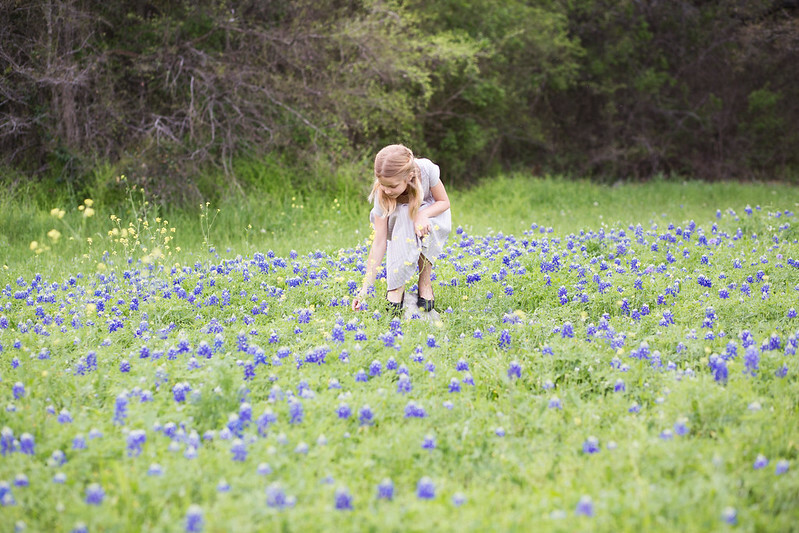 She loves flowers, so she was in heaven being surrounded by all of these bluebonnets. She could have stayed here for hours. I just sat back and quietly snapped away as she did her thing. It felt enchanted, really. Like something out of a fairy tale. Kids are so awesome. 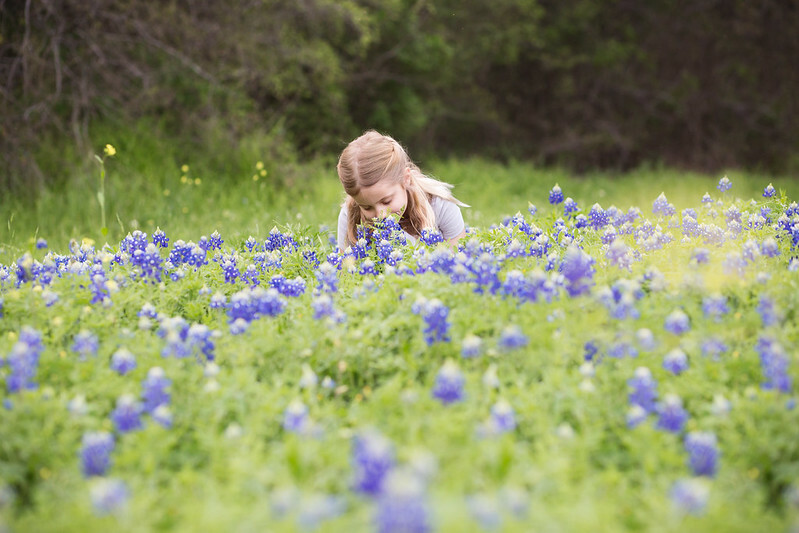 We adults might give the wildflowers an appreciative glance whereas kids just get in there and enjoy and experience them. I've read that some people feel blog or Instagram photos make life seem too perfect. I disagree, in part because I know that no one's life is perfect. But also because I feel almost the opposite is true. I believe it's actually quite difficult to adequately capture the beauty and sentiment in these everyday moments on camera. It takes lots and lots of practice. I've been working at it for 3 1/2 years and I still often don't get it right. The camera just can't see like the human eye (or heart). And yet I'm thankful for the opportunity to try. Oh right, the dress! So perfect! Understated and lovely. I just love linen. I haven't really checked out what Joann has as far as linen because, as you know, I mostly shop at my local independent fabric shops. But I want to go to Joann's to pick up the new Lisette patterns (at a discount) so I'll check it out! I absolutely adore the feel and drape of linen. It even has a distinctive (and very pleasant) smell. You know, I think I'm the same about fabric as I am about flowers and plants, I want to get in there and feel them and smell them up close. :-) My mother says "you take such a sensual pleasure in fabric." And yes, that feeling I get when I find a really gorgeous fabric at the shop is ... ahem ... something akin to lust. LOL. this photo shoot is amazing! I especially love the last 2 photos!! gorgeous!! 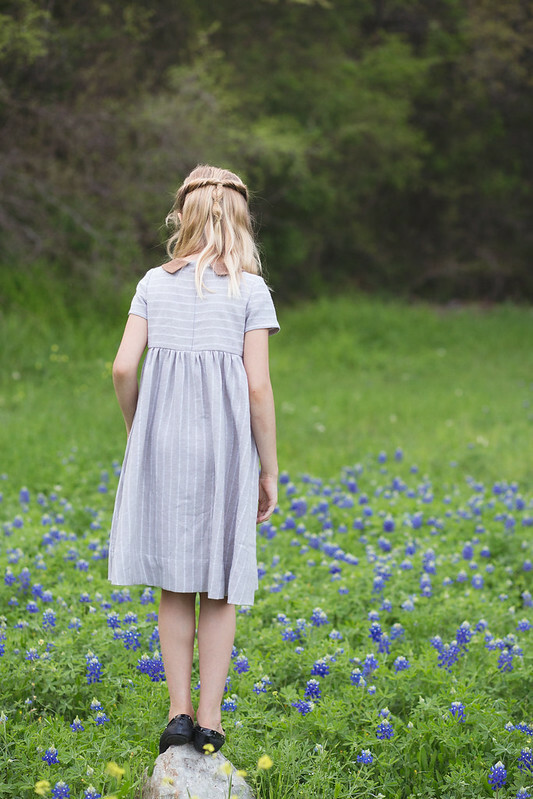 the dress is so so pretty and I think it is the perfect pattern for our growing girls! I must try it asap! my blandine would love it for sure. I am amazed at how well your stripes match ! you rocked them! Ohhhhhh Indigo! Such a sweet gal - you captured her beautifully here! It seems really clear that she's grown a lot lately, even in just seeing photos on your blog every so often. 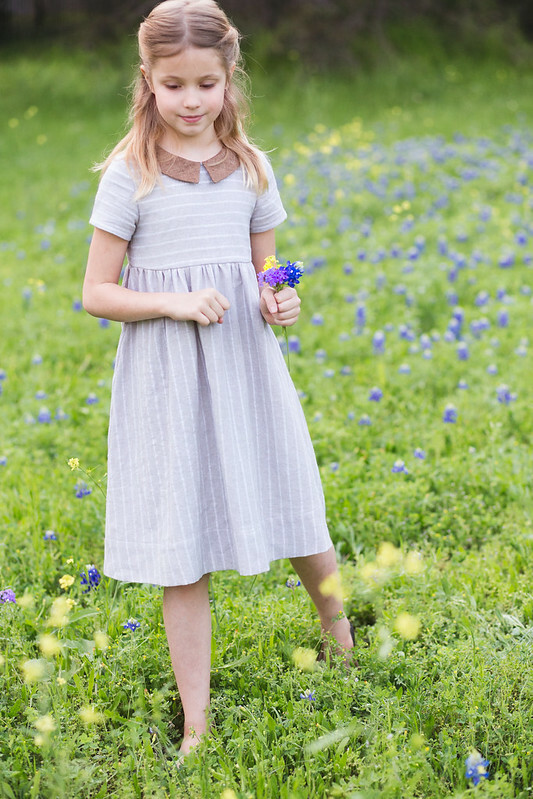 I'm looking to you to show me how to dress an older gradeschool age girl; noticing that as she approaches 7, the styles i have always made for E may not fit her age anymore...it'll be a fun new challenge! I just love this dress. Also didn't know burda sold PDFs! Thanks for the tip! Rachel this dress is stunning. 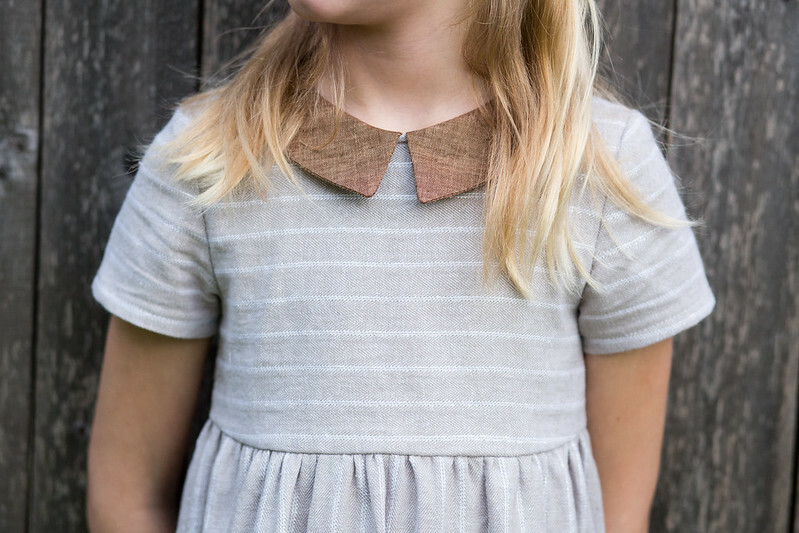 The main fabric is divine and the coconut collar just perfect. If that's your "backyard" and you obviously have a great camera then of course your blog photos look awesome. It's only trying too hard if you drag the kids on a three hour drive to get the right location then insist on your kind of photo shoot. 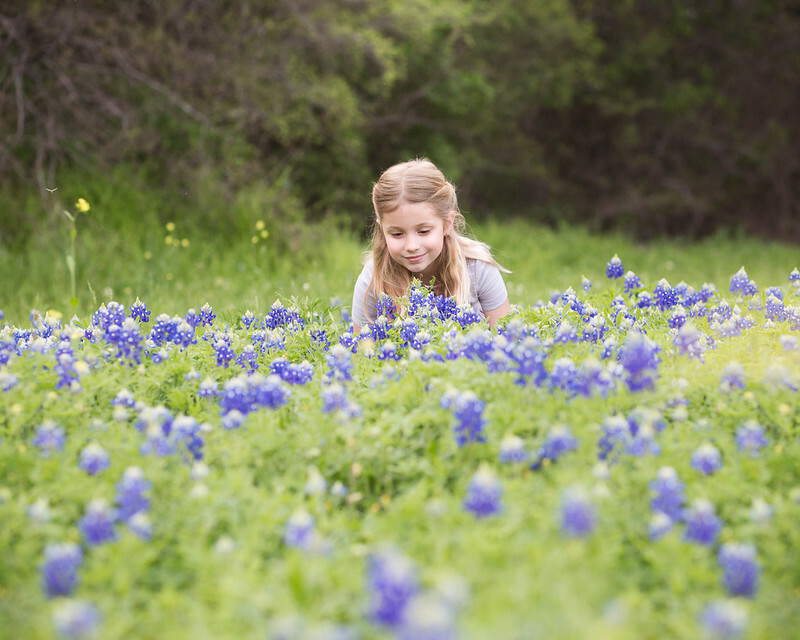 Nothing overdone here, just a beautiful, lucky girl in lovely surroundings! Oh, I love it! I wonder if I could get my girls to wear those colors. 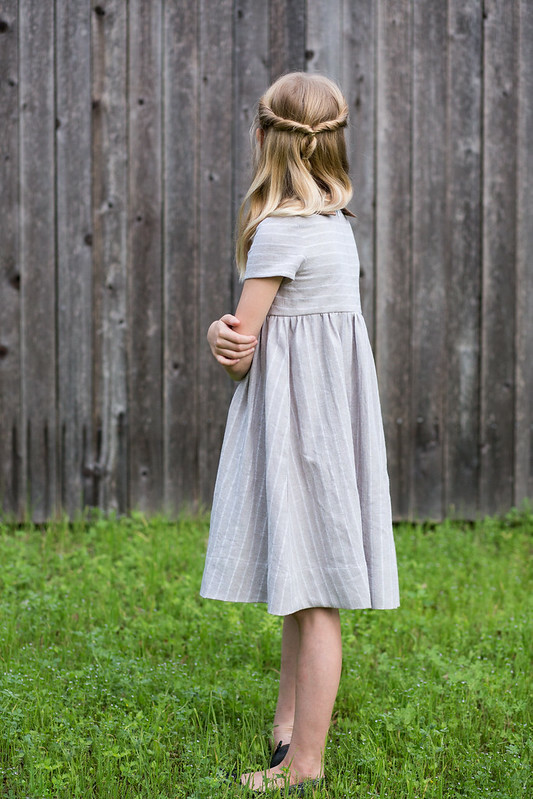 I agree with you about Joann's linen, too, I've been really happy with it (and have actually used that brown one in a dress for younger daughter back when she was not so picky about color. I think I need this dress pattern as well. 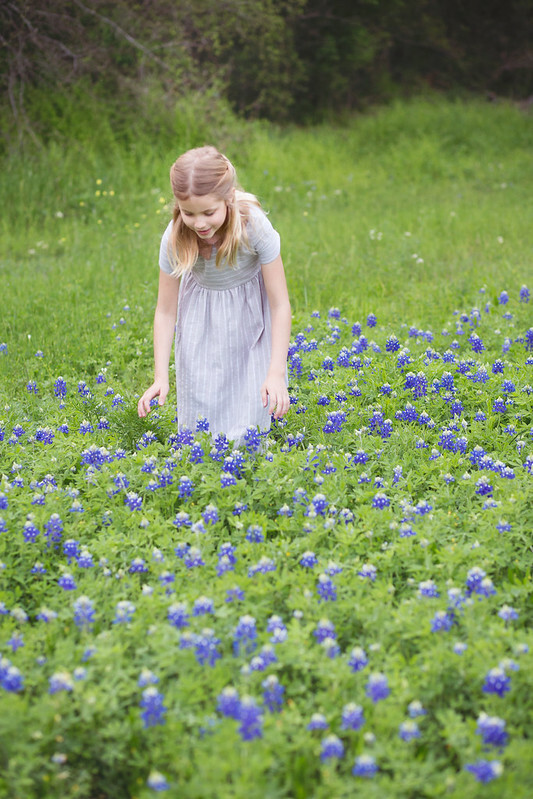 Oh those bluebonnets are calling to me!!! I this our mind takes us back into a place and a space special photos were taken. If I just flicked through these photos without reading the story I would have said they were nice. Knowing what was happening and how special that time was for the two of you makes them look different. OK maybe not look (although they are awesome) but feel so special and gentle. I can see how finding styles for Indigo can be a more difficult task! This dress is wonderful though! This is beautfiul Rachel. i love linen and grey and its a lovely style and such pretty photos! 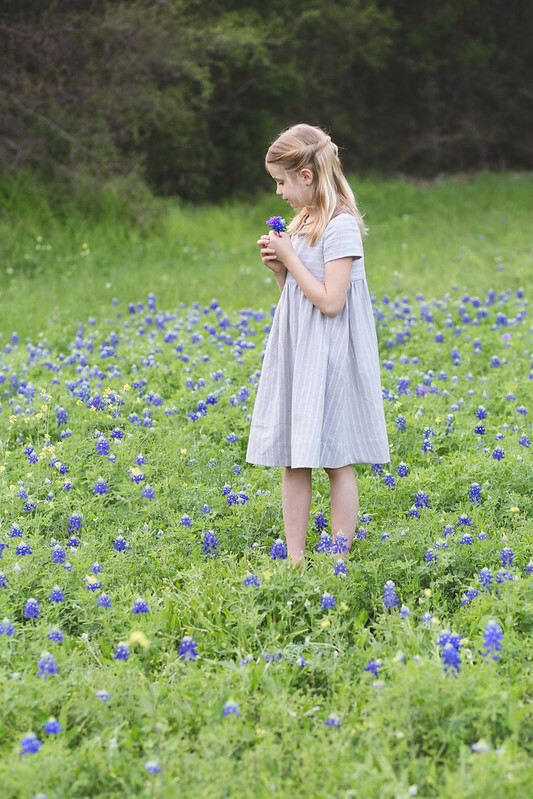 This dress is so beautiful, and Indigo looks lovely in it. 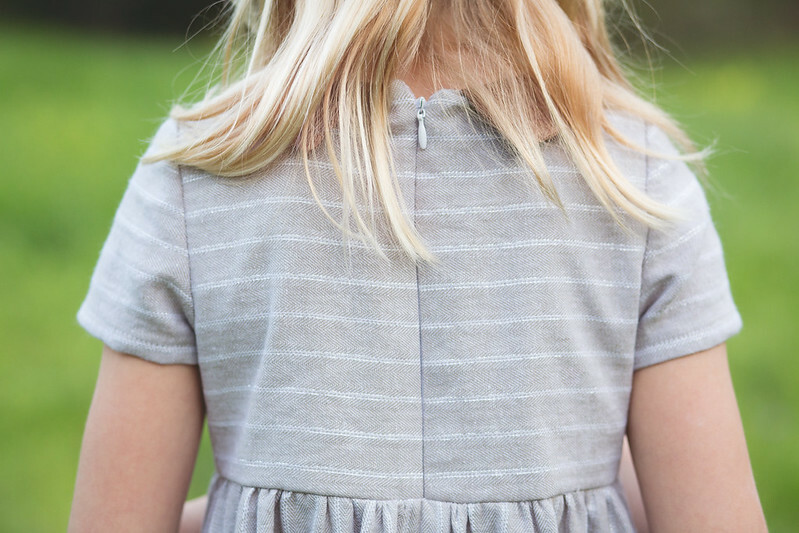 It is harder to find nice styles for older kids, but this is a great pattern-fabric combo. Well done! Rachel, you sell yourself short! You actually do a fantastic job of capturing the magic and beauty of your everyday moments, probably more so than other blogger I read. You have such an eye for capturing the beauty and lighting in everyday moments, even if something as everyday as playing LEGO or taking care of Hazel. The magic is there, I kid you not. As for this dress - yay!! Such a great linen find! I've not seen that one at our local Joann's yet (which doesn't surprise me - it's not the best). I've used the same brown one though that you used for your coconut collar:) And the invisible zipper/stripe matching - there's great sewing talent there in addition to the amazing Wondertape:) Indigo looks so lovely in this dress - it really seems to suit her personality (without truly knowing her, but you hopefully know what I mean). I will watch your future pattern choices for her with interest as she is just a year older than my youngest and has a similar build. Sadly, I've pretty much given up sewing for my 11 yr old, aside from a t-shirt/pair of shorts here or there. She just won't wear it. So I'm enjoying the girl sewing with my youngest while I still can! Yep, this one is great too! So beautiful on her...and these photos, ahhhhhhh! !